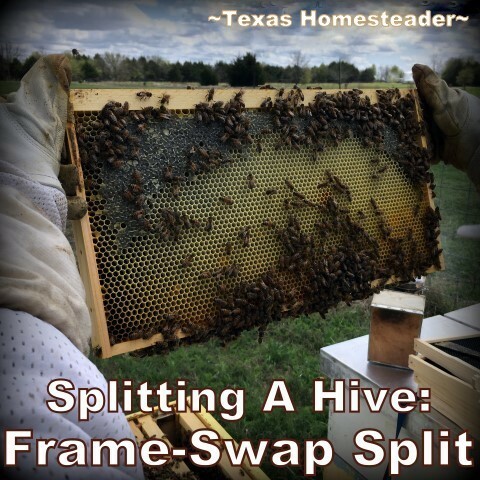 Frame Swap Split for Beehives - Double Your Hive Numbers! I wrote about the ‘Walk-Away Split’ we did in our hives last year. That time we did a Half-n-Half split. Back then we simply took the top box of our 2-box beehive & placed it atop a new bottom board next to the existing hive. Then we put an empty deep hive box filled with empty frames on top of each hive and added a new lid to the new split hive & walked away. Of course one of the hives will contain the existing queen. The other hive will simply make a new queen with one of the eggs contained in a frame. But on this occasion we’re doing a Frame-Swap Split instead. We feel it’s not quite as hard on the hives. First we decided which hives would be split. We wanted to look at strong hives that could take the pressure of being split and still bounce back & provide a honey harvest. This Frame-Swap Split seems to make it easier for the hives to recover. On this day we chose 3 of our hives for a split. This will increase our apiary hive numbers by 3! 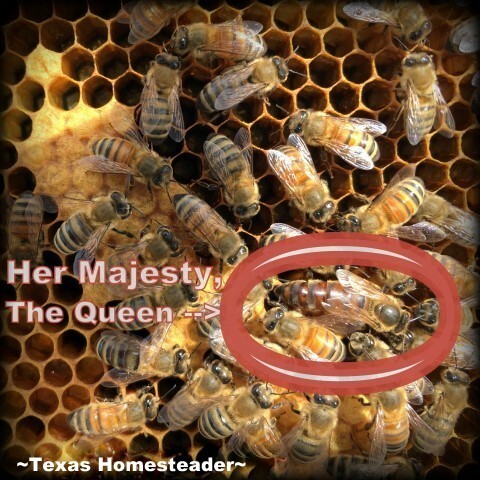 Locating The Queen… or Not! So we pull the top & inner cover and inspect the frames in the top box of our strongest hive. RancherMan’s looking for a good mix of frames to move to the new hive. He wants some frames of honey & pollen, some of capped & uncapped brood and some with eggs. As he chooses the frames to move to the new hive box he keeps as many worker bees on the frames as he can, but he’s looking for the queen. He’d really like to keep her in the existing hive if possible. But since the existing hive is two-deep-boxes high, it’s not the end of the world if he doesn’t lay eyes on her. He just wants to see that he’s not moving her to the new hive. Splitting The Hives – 1 Into 2! So after he’s moved the 4 frames to the new empty deep hive box, he’ll replace the frames he removed with empty frames. And to the new hive box he’ll add 4 empty frames and a feeder. He’ll be feeding 1 part sugar dissolved into 1 part water to help the new hive along. But we expect both the existing hive as well as the new split should be able to bounce back quickly & start filling the empty frames with brood and honey. We’ll check the new hives in about 4 weeks to see if both contain a queen. The new split hive probably won’t be ready for a honey super box expansion yet, but we’ll put honey super boxes on the existing hives so they can begin filling it with honey for our harvest. 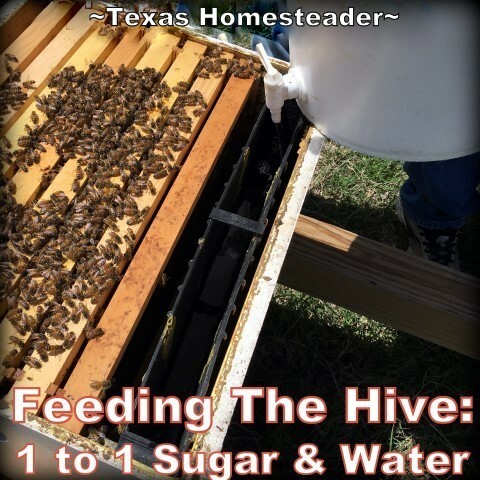 In this part of NE Texas our honey harvest is usually the first week of July. Last year we had a small group of bees move into a hole in a tree we had been meaning to cut down. Must have been small because before they moved in The Bird Man Who Lives With me had his largish hand in the hole and it was quite tight. I watched them all summer and fall and am still watching them, and talking to them telling them how grateful we are that they are there and that they should not go to the place across the road because they SPRAY. We don’t mind messy fence lines so we don’t spray. I keep saying we need to get a hive box and set it in front of the tree to see if they might like a roomier abode. So far we haven’t done that. I saw some very interesting hive configurations at the mother earth news fair last year. We also have friends who have lots of bees and sell honey, and zillions of chickens which they raise both for meat and for eggs. Our barn is practically done and chickens are soon to come fight bugs and weeds for us. Just waiting for things to dry out a bit so we can move dirt and such. I wish you all could come out to Oregon and visit!!! Well done! 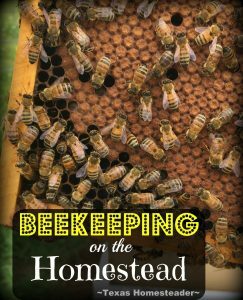 Your bee posts are so encouraging for beginning beekeepers! Just split one of mine yesterday, it was a boomer–4 med boxes of bees. I usually put my old queen in new hive, but just could not find her, so ended up doing a walkaway. Crazy how they multiply this time of year! I’ve always wanted to have been but I worry that they’re high maintenance. I hear about diseases and stuff. So I’ve always stuck with chickens. They are a piece of cake.